Emotions are an extremely important part of our lives, and they profoundly affect our actions, even though we’re not always aware of them. Skillful understanding and balancing of emotions is called Emotion Regulation. Emotion regulation is a general term that encompasses several component parts, which include being aware of and paying direct attention to emotions, understanding and labeling emotions, allowing emotions to occur without necessarily acting on them, and managing or modifying emotional reactions so as to meet important goals. 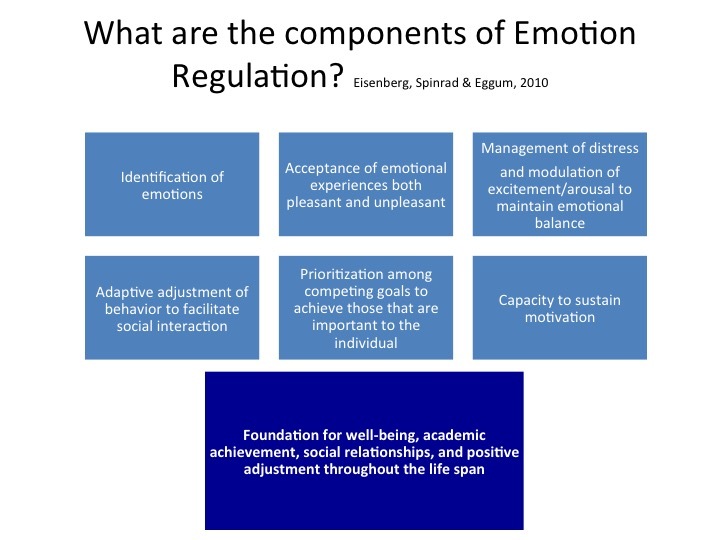 Emotion regulation skills develop over the course of infancy and childhood and continue to mature during adolescence. These skills are critical to mental health, academic achievement, and good social relationships. Poor emotion regulation skill (called emotional dysregulation) is viewed as a core feature of emotional problems and maladjustment. Such dysregulation has been linked to problems like depression, substance abuse, cutting, poor performance and aggressive behavior, to name a few. Emotions can feel “out of control” when adolescents experience acute or long-term stress. Under stress, humans cope in a variety of ways. One coping tendency is to avoid or suppress difficult emotions, such as anger, jealousy or fear. Behaviors that may reinforce this emotional avoidance, like substance abuse, can become a preferred way to cope because they temporarily and artificially reduce the intensity of difficult feelings. An opposing tendency is to become preoccupied with emotions, for example, by constantly worrying or ruminating about problems. This coping style can lead to heightened anxiety and depression. Over-reliance on either extreme, or cycling between both, can prevent adolescents from developing the balance and flexibility which is the hallmark of healthy emotion regulation. Learning how to deal with emotions is an important developmental goal. The skills involved in emotion regulation may be fostered by becoming aware of emotions and by learning how to manage them without pushing them away or getting tangled up in them. Emotions are not static. Therefore, to train in the skills of emotion awareness, identification, and management, it is useful to practice noticing them “on the spot.” Mindfulness is the practice of purposeful attention without judgment. Mindfulness meditation is simply the practice of being aware of present-moment experience without trying to push it away or over-engage. Mindfulness helps train the mind to pay attention and notice, so that action can be taken with greater reflection. Emotion regulation IS NOT emotion suppression. In addition to helping participants learn about their emotional experience and allow it to be as it is without needing to react, L2B cultivates wholesome emotions such as compassion for self and others and gratitude.